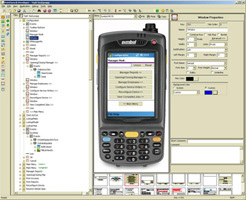 PointSync Mobility Platform 4.0 is for rapid mobile application development. The PointSync Mobility Platform 4.0 is MobileDataforce's latest version of the PointSync® Mobility Platform, the next generation of the company's award-winning rapid application development solution for mobile environments. This new 4.0 version features visual debugger, data mapping wizard, support for hosted environments, SQL builder, and 220 pre-built mobile application functions. PointSync Mobility Platform 4.0 is for rapid mobile application development. The PointSync Mobility Platform 4.0 is MobileDataforce's latest version of the PointSync® Mobility Platform, the next generation of the company's award-winning rapid application development solution for mobile environments. This major release includes over 150 new features, innovations, and enhancements to PointSync Developer, PointSync Manager, PointSync Server, and PointSync Mobile. This is a very significant release in MobileDataforce's 7-year history. PointSync Mobility Platform 4.0 will change the way mobile solutions are developed and will reduce the time it takes for our customers to recognize a return on investment by reducing the time it takes to design, develop, and deploy new business critical mobile solutions.